“The Monuments Men,” based on one of the greatest treasure hunts in history, opens nationwide on Friday. Directed by and starring George Clooney, the film focuses on a World War II platoon that was instructed by Franklin D. Roosevelt to rescue artistic masterpieces from Nazi thieves and return them to their rightful owners. On that note, we at TravelPulse decided to take a look at the greatest stone monuments in the world, which are works of art in themselves. These are not only awe-inspiring sights, most of them also hold great historical significance and should be witnessed at least once in your lifetime. 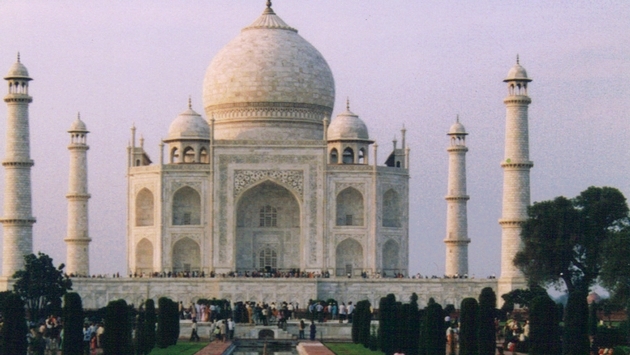 So, without further ado, here are the top 10 stone monuments in the world. Stonehenge—located in Wiltshire, England—is a prehistoric monument that has been dated as far back as 3000 BC. Stonehenge has perhaps captured the world’s attention for so many years because it is so mysterious. There are countless theories as to how the large stones were moved to their destination, as well as numerous theories surrounding the monument’s original purpose. Because there are no written records from the culture that constructed Stonehenge, it is difficult to know for sure. But one thing’s for sure: The fact that a culture dating so far back was able to construct such a colossal stone monument without the use of advanced technology is impressive in itself. The Parthenon took about nine years to build, and another six years to decorate. Dedicated to the goddess Athena, it stands about 45 feet high, 228 feet long and 101 feet wide. The temple has become a symbol of Ancient Greece, Athenian democracy and western civilization since being constructed in 438 BC, and it is also considered one of the greatest Greek art pieces ever created, boasting many incredible statues. The building obviously isn’t in pristine condition after all of these years, but seeing it in its current form is proof enough that the ancient Greeks knew what they were doing when it came to architecture and art. Spanning more than 1,200 acres and rising more than 5,700 feet above sea level, Mount Rushmore is spectacular in terms of sheer size alone. Add the fact that it sports 60-foot statues of the heads of four historic U.S. presidents, and you have yourself a world-famous monument. Honoring George Washington, Thomas Jefferson, Theodore Roosevelt, Abraham Lincoln and the first 130 years of U.S. history, Mount Rushmore has been attracting visitors far and wide since construction ended in 1941. Construction ultimately had to be stopped short because of lack of funding (a tribute to the Declaration of Independence, U.S. Constitution and Louisiana Purchase were also in the original plans), but what masterminds Gutzon Borglum and son Lincoln did with the funding they had has stood the test of time. The Taj Mahal has become a symbol of great architecture and world heritage since it was completed in 1648. Built by then-emperor Shah Jahan in memory of third wife Mumtaz Mahal, the Muslim work of art reaches 240 feet up into the sky. It is considered so precious that a protected area of 10,400 square kilometers surrounds it. The white marble mausoleum is highlighted by a large dome and accompanying minarets, and it includes a spectacular tomb inside. Surrounding the monument is a 980-square-foot garden. The Taj Mahal attracts about four million visitors annually these days. What makes the Great Pyramid of Giza so noteworthy? Well, for one, it’s one of the seven wonders of the ancient world, and it’s the only one still largely intact. But beyond that…it’s also more than 450 feet high and the base measures more than 750 feet long. Like Stonehenge, there are a variety of theories concerning how this monument was built in ancient times. It was the tallest man-made structure in the world for more than 3,800 years. It contains three known chambers, features ascending and descending passages, and is surrounded by a complex of temples, pyramids and tombs. A monument that has been standing since about 2560 BC deserves just a wee bit of recognition. Easter Island boasts 887 ancient monumental statues called “moai” that resemble people. They are said to have been constructed between 1100 and 1680 by the ancient Rapa Nui civilization. These statues were made out of several different types of rocks, including basalt, obsidian, red scoria and tuff. They averaged 13 feet tall and 14 tons. The biggest and most popular statue is called “Paro,” weighing 82 tons and measuring more than 32 feet long. The statues are not only intriguing because of the mystery behind their movement, the Rapa Nui people also came a long way to settle in Easter Island, which is one of the more remote inhabited locations in the world. There are several theories behind Machu Picchu’s creation, but the 200 structures that span for 32,000 hectares and rise more than 2,400 feet above sea level are a sight to behold. Surrounded by the Amazon basin on the eastern slopes of the Andes, there is no doubting the beauty of this place. It is a notable agricultural, religious, cultural, ceremonial and astronomical center. It is also revered by architects and engineers for its design and its ability to seamlessly blend into the natural landscape. One of the premier symbols of the ancient Inca civilization, Machu Picchu is a destination worth visiting and studying. The scene of countless gladiator battles and animal fights, the Colosseum—originally known as the Flavian Amphitheatre—is not only grand it scale, it’s also a symbol of Ancient Rome. Emperor Vespasian commissioned the elliptical building in 72 AD before it was completed in 80. It boasts 80 arched entrances, can house 55,000 spectators and measures 188 meters long and 156 meters wide. While animal activists may cringe at the Colosseum’s history (9,000 animals were reportedly killed during battle), there is no denying the architecture, scale and history of the Italian monument. The Leaning Tower of Pisa wasn’t exactly planned out perfectly, but, then again, its glaring imperfection has made it one of the world’s most recognizable landmarks. The 183-foot-tall bell tower began leaning when the soft ground below it started giving way to its weight. At one point, it leaned 5.5 degrees. After restoration efforts in the 20th and 21st centuries, it now leans 3.99 degrees. A complement to the Cathedral in Piazza del Duomo and a cultural symbol of power, the Leaning Tower of Pisa continues to awe worldwide visitors. But is the Leaning Tower of Pisa a testament to power, or uniqueness? And, of course, we have the Great Wall of China. The Great Wall extends for about 5,500 miles from east to west China. The dragon-like structure weaves through grasslands, mountains, deserts and plateaus, its architectural beauty complemented by the natural surroundings. It boasts a history spanning about 2,000 years, with its construction beginning in the Warring States period in 476 BC. It officially became the Great Wall when Emperor Qin Shihuang connected the different sections during the Qin Dynasty to protect from the Hun invasion. Most of what you see today was created during the Ming Dynasty from 1368 to 1644 AD. The monument holds great significance for China and it’s a central figure in the country’s mythology.